How long does it take to get paid on a sale? How will I get hired with a company? What is the initial cost of becoming a Real Estate Agent? How much can I really make as an Real Estate Agent? 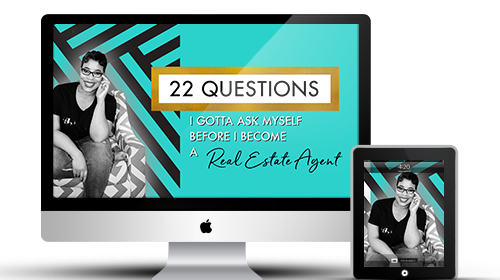 22 Questions I Gotta Ask Myself BEFORE I Become a Real Estate Agent is exactly what you are looking for. I know this because I'm just like you. I've spent over 10 years deconstructing and reconstructing all the madness of the real estate business, and synthesized the most important questions and answers into a course that you can learn from right now. My eCourse is a step-by-step guide that will eliminate all confusion you have in a matter of minutes, and totally clear your path to become a Real Estate Agent. You want answers? All you've got to do is watch (or listen to) the 22 questions and answers. You'll gain more and more insight with each answer. And in less than one evening you'll know enough to move forward. 22 Answers to All the Questions You've Been Asking And Haven't Been Asking (because you thought they were "stupid"). All presented in a beautifully produced video course that you can access from anywhere and at any time. That's right - you pay once and you'll have access for life. All you have to do is click on the button below and follow along through the simple and secure checkout process. In less than 5 minutes you'll be watching the video! "I can't thank you enough for all the information your course provided. It answered all of the questions I had, and helped me decide that pursuing a career in real estate is a right move for me. Because of your honesty, I am fully aware of the risks involved, but also look forward to the benefits. Thank you again for this wonderful and helpful course." - Melissa F.
"I have gone back and forth for a long time wondering if becoming a real estate agent would be a good fit for me. This course answered so many of the questions I've had in a straightforward, easy-to-understand style. I now am so excited to get started! I feel confident and very reassured about my decision!" - Chrissy B. How Much Is Searching For Answers And Delaying Taking Action Really Costing You? As women, I know our free time is limited. I kept this in mind when I created 22 Questions. I know you may not have the time to do all the research required to get all the answers you need about this career. Since I have been a Realtor for 10 years; it was easy for me to write down the most important things you need to know and provide you with detailed answers simultaneously. I want you to stop researching, right now. I have already done the accurate research for you. What would have taken you months to put together, is now at your fingertips and will take slightly over an hour to complete! For just $27 you can have your most pressing questions answered and be ready to finally move forward with your Real Estate Agent career in a couple of hours. Or, you might decide that this isn't for you. Let's be honest, becoming a Real Estate Agent will require an investment of time, money and energy on your part. So it's wise to get all the info you need before either moving forward or moving on. I'm offering you either progress or closure. You can either keep procrastinating (which is likely fear), keep searching for the answers to your questions or, for just $27, you can get the answers you need and start building your future today! P.S. Girlfriend, just think...you can hit "play" on your video and be moments away from all the answers that you've been inquiring about for months! I inspire and propel women (like you) who are passionate about becoming a Real Estate Agent. I do this work, to help liberate women that desperately need a career with flexibility, greater income opportunity and more FREEDOM to ENJOY the things she loves. My online school is the # 1 resource for women who want to make a career shift to becoming a Real Estate Agent. My courses supply you with the clarity and confirmation you need prior to making your decision about entering this career. I am genuinely a trusted sister-friend candidly sharing my decade of wisdom (both the ups and the downs) as a licensed Real Estate Agent. Welcome to 22 Questions, Sis! Video: 22 Questions (& Answers)! 22 Q's PowerPoint (Just an FYI)!